Most of my flying club is at Oshkosh for the week. And the one plane they didn't take is the one plane I can fly as a student! So I went out today for two sessions, about an hour and 45 minutes each in the morning and late afternoon. I really wish I could leave the pattern, but I'm finding plenty to focus on IN the pattern. All told, I did seventeen trips around the pattern. Well, actually I did eighteen trips around the pattern because I was waaaay too high on one approach in the morning and had to go around. But I did seventeen landings. Fourteen of them were genuinely good, and I seem to have figured out how to avoid bouncing. The density altitude is pretty high, about 2400 feet, so my ground speed is higher than my indicated airspeed, and that can result in a bounce if I have any extra airspeed. So I WAS flaring at about 70-75 mph IAS, and that is definitely too fast. The cheat sheet that John gave me, though shows 70-75 on final, so.... But the problem that had me bouncing is definitely that I was too fast, so I'm now shooting for 65 going into the flare. And today I only bounced once, and it was only a slight bounce. Four of my approaches were high this afternoon, but I just dialed in some more flaps and still got down in the first third of the runway. No problemo. What I really wanted to write about, though, was the feeling I had toward the end of my afternoon/evening session. It was 7:30 or 8:00, and the sun was orange/red and low in the West. There was little wind (3 knots) and it was pretty much perpendicular to the runway. Traffic was using runway 32. A quarter mile off the approach end of 32 there begins an expanse of farm fields. The fields are patched, with thin lines of trees separating them, and there are horses in some of the fields and an occasional building. The fields are very green, and the orange light of the sun made them seem even more so. Maybe because it was my seventeenth landing of the day, certain parts of the process were becoming natural, not mechanical, but natural. 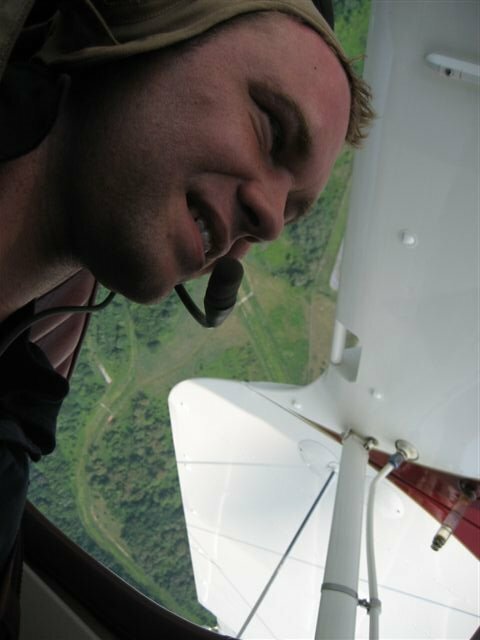 (There's a big difference there-- "mechanical" would imply that I was moving the controls through rote memorization regardless of the conditions affecting the plane, whereas "natural" implies that I was responding to changes in altitude, airspeed, etc., albeit without too much conscious effort.). As I was on downwind on my last lap around the pattern, a plane cut into the pattern on the base leg, and I had to extend my downwind leg by a half mile or so. I was low, the sun was low, and the landscape was absolutely beautiful. As I banked into a turn to base, 700 feet or so above the ground, I had a feeling like it was me flying, not just me "making an airplane fly." I wasn't thinking too much about how I made the plane turn, I just wanted it to turn and my hands and feet did it automatically. We (the plane and I, like one) swooped down over the trees and fields on base, then into the sun for final and a good landing. 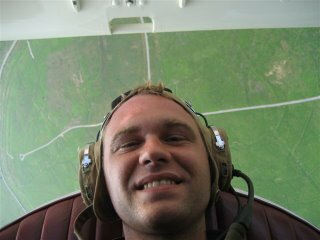 I really felt like I was flying, and it was wonderful! 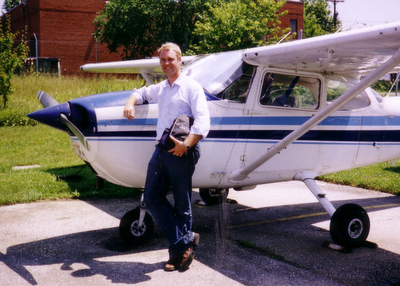 I flew six times in the first month I was taking lessons, then between a death in the family, an out-of-town trial, maintenance issues with the plane, 04G going, various scheduling issues, and weather, I flew four times in the next six months. I spent those months reading six magazine subscriptions, a bunch of books, playing Flight Simulator, listening to a half dozen flying podcasts-- I passed my written exam almost six months ago with a 97. But no flying. I thought I was NEVER going to get anywhere with this flying obsession. 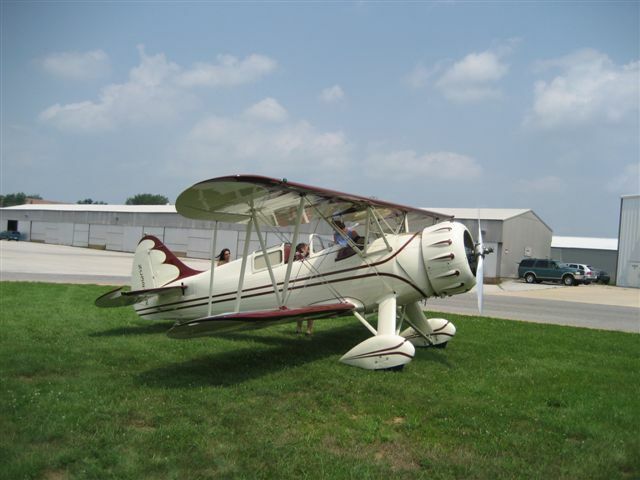 My wife, although hesitant about the idea of flying in a small plane, grew to look forward to the rare times I would fly because of the miraculous improvement in my mood. I was flying so sporadically, though, that it felt like the "two steps forward, one step back" syndrome. So I knew that if the weather was good, Friday June 30th could be the day. As I headed out the door for the airport, I checked my flight bag: headset, keys, kneeboard, logbook.... logbook? logbook?!?! It wasn't there, and as I ransacked the house, glancing up through the skylights at the clear blue sky and motionless leaves, I thought that this was exactly my luck. No logbook, and my certificate is in my logbook, and FARs say a student can't fly solo without the certificate. I headed to the airport and explained to John. I realized that I must have taken the log into my office after my last flight (I log my time online at logshare.com) and left it on my desk. So I left the airport and headed to work, picked up my logbook, and headed back to the airport. And as I drove, I could see the tops of trees tossing in a wind that was picking up, and I knew, I just KNEW that it was going to get gusty and I wouldn't solo. 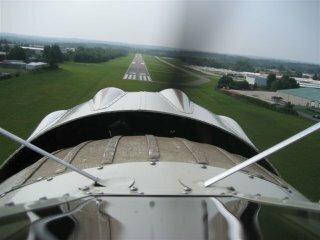 But the wind was pretty much right down the runway, and John and I flew for almost an hour, and everything was fine. 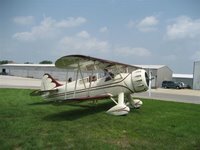 I botched a few approaches and got to practice my go-around technique, but that was fine too, and John had me taxi over to the hangar. I ran to the bathroom, received a call that I had to be in Tyson's Corner right after lunch, and ran back to the plane. John had his flight bag out on the ground and was endorsing my logbook. I was nervous, but.... I had the disciplined calm feeling I get in the courtroom-- when the stakes are high, and all you can do is have faith in your abilities and the outcome, you just trust in your training and ability and keep going. That's the feeling I had, and it's funny to me that the two things feel so much alike. So John walked over toward the approach end of 32 and I buckled up, shut the doors, and started the pre-start checklist. Then John walked back and unchocked the plane, with me feeling like an idiot. I continued through the checklist and started the plane, and checked the oil pressure, and.... 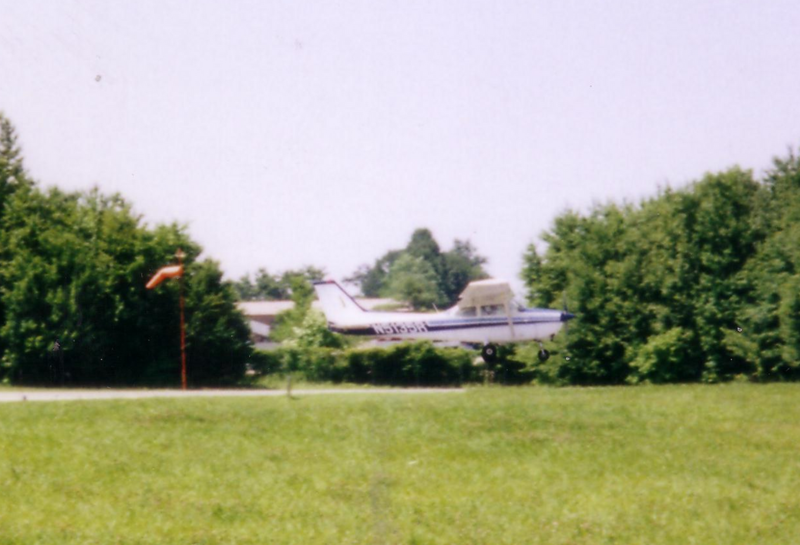 I had never flown the plane when the engine was hot, and the pressure tends to be a bit lower when the engine's hot, apparently, and the needle was hanging down just below the green even when I ran it up to 1500 rpm, and I had never seen it that low after starting. So I shut the plane down, and John walked back AGAIN and looked at it, and told me it was fine. I taxied out to 32 and did the takeoff checklist. Four times. And it seemed like the checklist was supposed to be longer and I was missing something, but it wasn't. And I checked final. Six times. And there REALLY wasn't anyone coming. So I made the radio call and rolled out, lined up, and went. And my first thought as I climbed out was that John must weigh a lot more than he looks because to me alone in the plane, it felt like 04G used to feel with the two of us. As I passed over the departure end of 32 I just started laughing. Out loud. And I slapped my knee, and slapped John's empty seat, and basically got completely giddy. Then I thought about power lines and wanting to be turning downwind before I reached pattern altitude (i.e., turned toward the airport before the first power reduction) and I got serious and just did IT. Made my radio calls, checked extended downwind and final before turning, held my altitudes, headings, and airspeed on the dot. I used about 20 degrees of flaps and flared a tad high, but the landing was basically fine. And as I rolled out, John's voice came over the radio: "Good. Do it again." As I taxied back past him he was smiling and waved, and it was NICE. As I was climbing out the second time I looked off toward Sugarloaf and the hills and thought how wonderful it will be to come out sometime (soon, I hope) and take off to go fly around. And the second landing was probably just about the best I've ever done. Chirp-chirp, right down the centerline, and I never felt the wheels touch down. John's voice came over the radio: "I bet you think that was a good landing!" The third time around I overshot my altitude a bit and had to come down from 1600 feet (pattern altitude is 1549). And as I flew I looked down and thought, "Holy S&^%, I'm flying!" And it was getting hot and a bit bumpy by this time of day, and it was tough keeping things smooth on final. I landed a bit left of the centerline, but I've certainly had worse landings. As I taxied back to park the plane I even remembered to radio UNICOM to have the fuel truck come out. It's funny-- in some ways it seems as if the stress should make you forget things. But it almost felt like not having John there to remind me to do things just made something click into place. Sometimes with John in the plane I would forget carb heat or be sloppy about airspeed and altitude, maybe because part of my brain knows he's there to remind me. 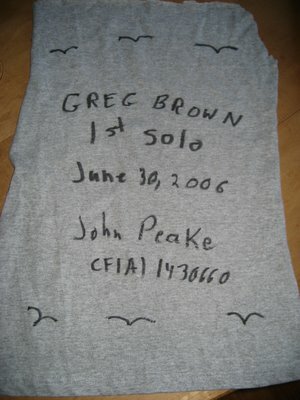 But solo, I did all my callouts just instinctively and it felt like the checklists and procedures were ingrained, and other than overshooting pattern altitude that once, I had all the numbers nailed. It felt REALLY good, and it felt like I knew how to do it. And I'm still looking for some way to get this grin off my face.